This a Free Software created by us. This Shell Script to Monitor & Update Remote Servers From Your Mac or GNU/Linux Computer to check the Ram & Swap usage, Load average, Available updates. 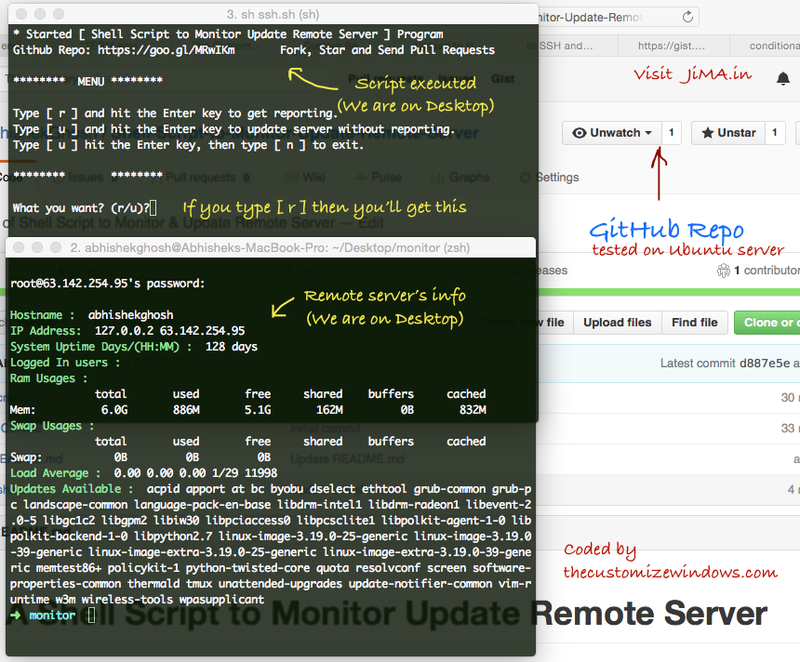 You can code contribute to the GitHub Repo of this script to monitor & update remote servers. This is more suitable for Cloud Servers, VPS than a dedicated server. For the dedicated servers, it is better not to be so much lazy. This script is for the Ubuntu servers. Previously, we distributed Bash Script to SSH and Update Ubuntu Server for HP Public Cloud. HP Public Cloud got closed. The current set of script has the codes from it. Executing the first script ssh.sh can control the other scripts. You should be at the Shell-Script-to-Monitor-Update-Remote-Server directory to run ssh.sh script. However, you can directly run monitor.sh and u.sh respectively for monitoring and update. You can also use unix pipe with monitor.sh, use cron from another server to send emails on change of certain parameter with cat, grep, cut etc basic unix tools. The script is designed for username – password based login to SSH. If you use key based authentication configured by you, you can also use this script. For Amazon like servers, you need to open and edit the script for the SSH command. You will get the result on desktop’s terminal. Check the source code on GitHub and update by sending pull request if needed. This Article Has Been Shared 4126 Times! Cite this article as: Abhishek Ghosh, "A Shell Script to Monitor & Update Remote Servers," in The Customize Windows, May 19, 2016, April 23, 2019, https://thecustomizewindows.com/2016/05/a-shell-script-to-monitor-update-remote-servers/.